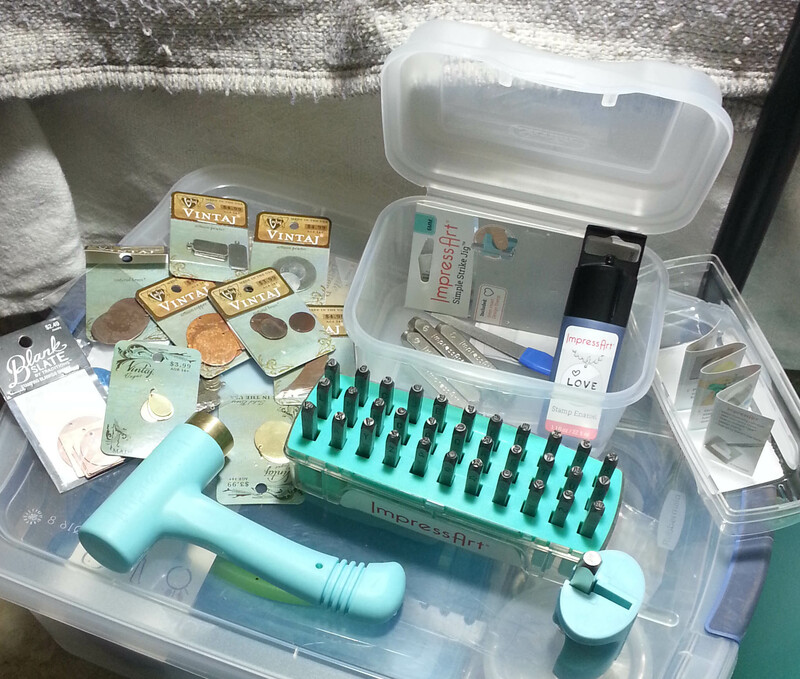 Earlier this month I shared with you my efforts to organize my bead stash. The primary motivation for that was because I am playing with designing jewelry again. Sometimes that means using beads and other jewelry components in my crochet wearables. Other times it means getting out the wire and jewelry making tools to create fun and sparkly pieces. 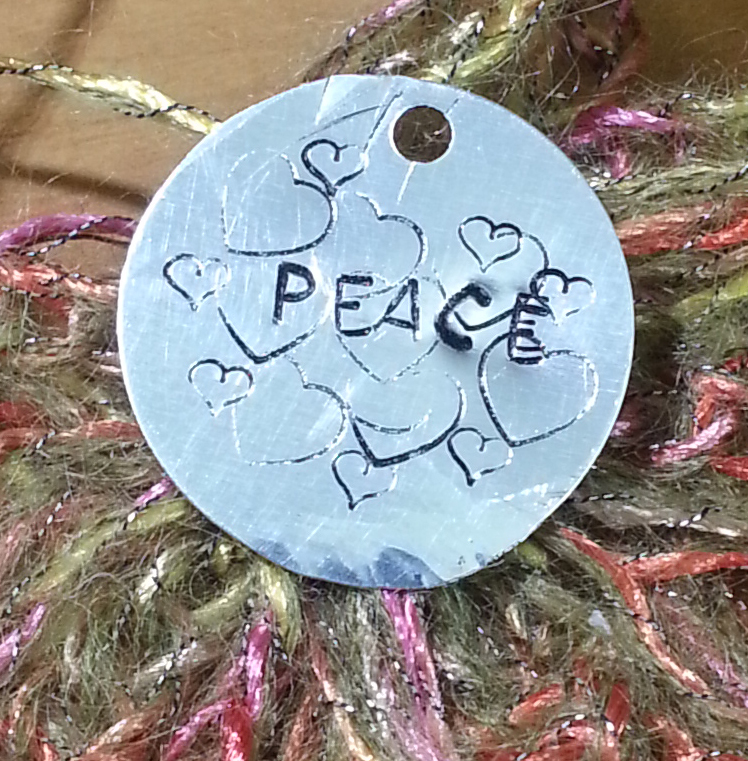 As I’ve been organizing things and working on various jewelry designs, I became interested in metal stamping. 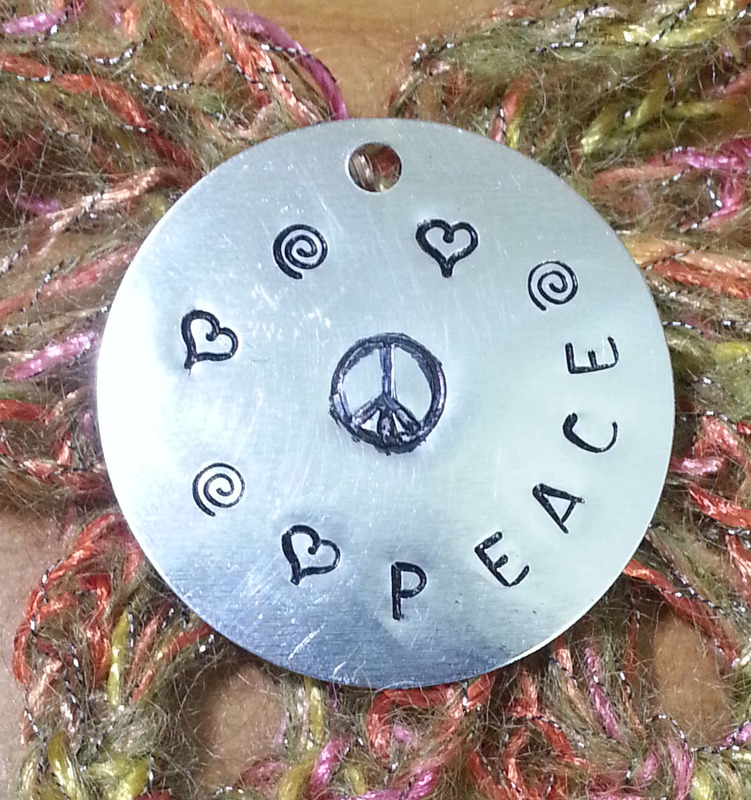 This is a great way to add words and even quotes to my jewelry pieces. Which meant acquiring some new tools and supplies. 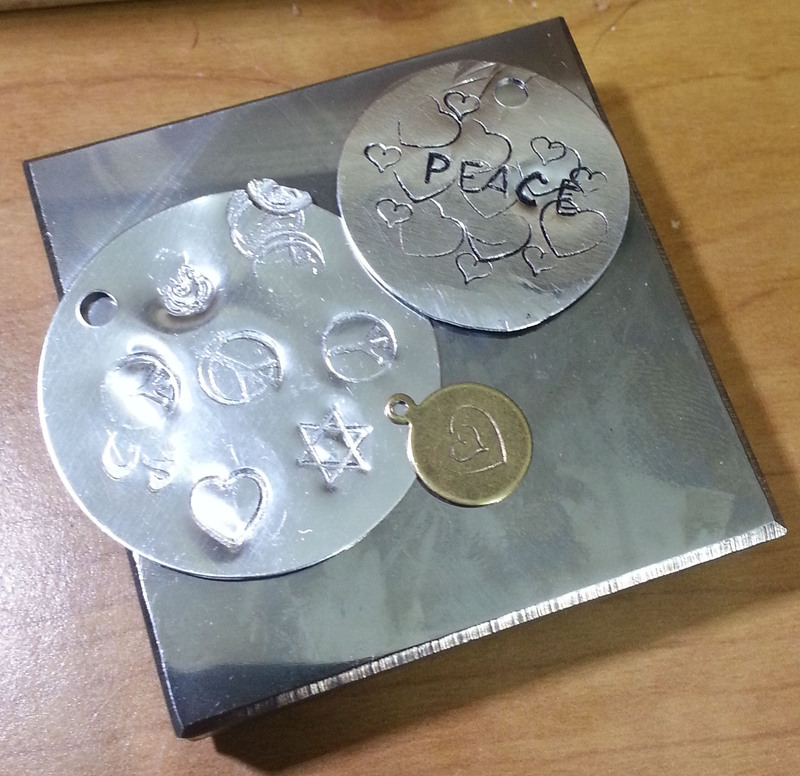 Yesterday evening I began to experiment with metal stamping. My sons were both very interested in what I was doing. This is definitely not a quiet craft. Both boys actually gave it a try. Then my oldest decided to be in charge of handing me the letter stamps I needed. This little disc of aluminum was our project we worked on together. Not too bad for a first attempt. One of the fun things about this craft form is bashing the stamps and metal with hammers. It’s a great way to take out some controlled aggression. I was being a little timid at first, which is why that first piece had some rather faint impressions. 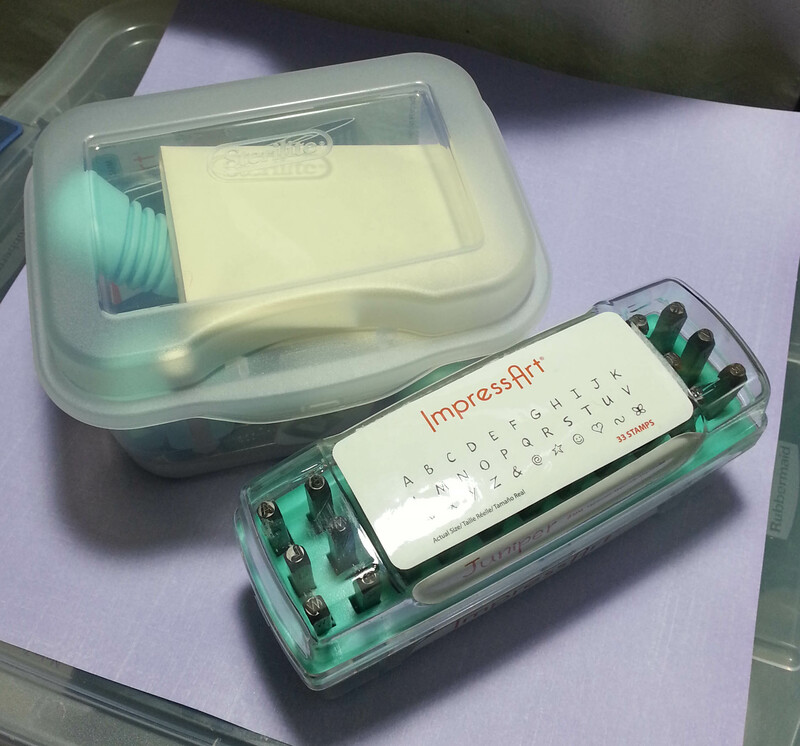 I soon overcame my timidity though and gave the stamps a hearty whack as needed. I made this little silvery aluminum disc next. I found I’m really not wild about aluminum, especially when it is this thin. It’s surprisingly strong, but super lightweight. I dropped this disc at one point and it practically flew away. I was hunting for it for 20 minutes. These discs would be great for earrings though, as being so lightweight they wouldn’t pull on the earlobe. Next I played with a brass blank. These blanks were labeled “natural brass” and don’t have that gleaming yellow color that I’m used to. 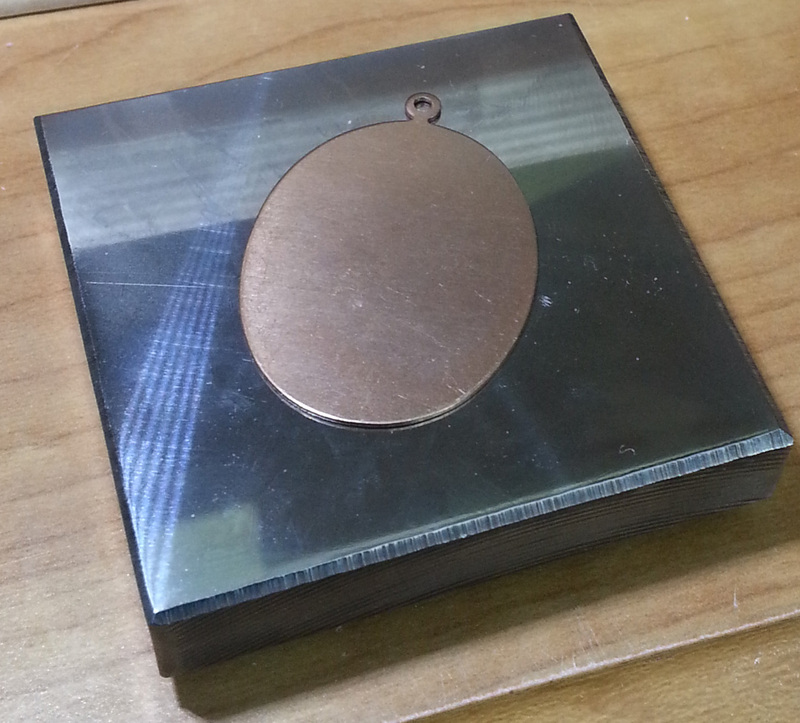 Brass is a harder metal than aluminum, so it took more force to create a good impression on the blank. I am still figuring out the exact method for placing my stamps before striking them. I actually made a little mistake on this piece, but corrected it. Can you spot it? Even with the mistake I’m pretty happy with how it came out. If you have been reading my blog for very long, you already know the answer to the first question. Yes, I’m nuts. That said, I also find learning new things to be a good way for me to manage stress. In some ways this is all an early Christmas present to me. Where I’m going with this is yet to be seen. I am playing around with the idea of finally getting my Etsy Shop going. It’s something I’ve wanted to do for years, yet it hasn’t ever come together. Or this could just be a stop along my art journey as I keep expanding my creativity. It may seem counter-intuitive, but I find new creative energy for my crochet work by exploring other (sometimes un-related) crafts. For the moment this new craft isn’t taking up a lot of room mentally or physically…. and I’m having a lot of fun playing with hammers. Hey Andre! There are a bunch of people who do Word of the Year. 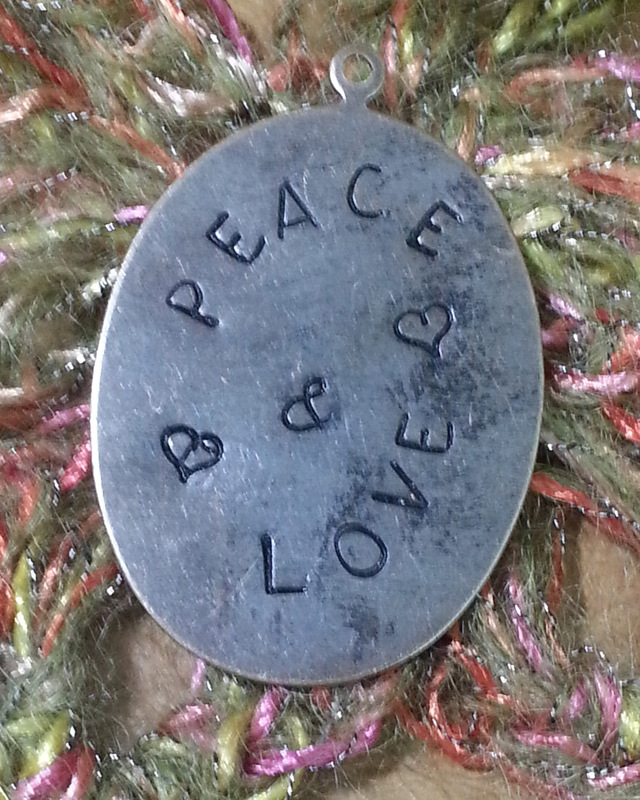 For your Etsy shipped maybe you could take orders for stamped pendants with the word and the year on ’em? Interesting idea. Will have to see what happens. I don’t have number stamps yet, so that might have to wait.